Combining both modernism and realism, Mabel Alvarez became a pre-eminent 20th century female painter of portraits, still lives and landscapes. Alvarez was born in Waialua, near the north shore of Oahu in Hawaii, and moved to California with her family who had made a fortune from land speculation in Honolulu. She was the youngest of five children of Clementine Setza Alvarez and Dr. Luis Fernandez Alvarez, a government physician. Her father, a native of Spain and son of the business manager to the Spanish king's son, was providing medical care to Chinese and Japanese workers imported to Hawaii. He was later the personal physician to Queen Liluokalani and her husband. Mabel's mother was a great beauty from a prominent family of musicians in St. Paul, Minnesota, and her brother, Walter Alvarez, was one of the founders of the Mayo Clinic in Rochester, Minnesota, a prominent Mayo physician who lectured widely. A nephew, Dr. Luis Alvarez, was part of the Manhattan Project at Los Alamos, New Mexico, and won the Nobel Prize for Physics in 1968. From early childhood, she had art talent and her father insured that she had a lifetime of financial security to pursue her fine art. In 1915, she enrolled in the leading art school in Los Angeles, directed by William Cahill. A mural she produced for the Pan-California Exposition in San Diego earned her a gold medal, and a charcoal portrait she did of a woman was used for many years on the cover of the art school's promotional brochure. Her self portrait was used in 1995 on the cover of the popular book, Independent Spirits, about women artists and published by the Autry Museum. An early promoter of hers was Arthur Millier, powerful art critic of the Los Angeles Times in the 1920s and 30s. 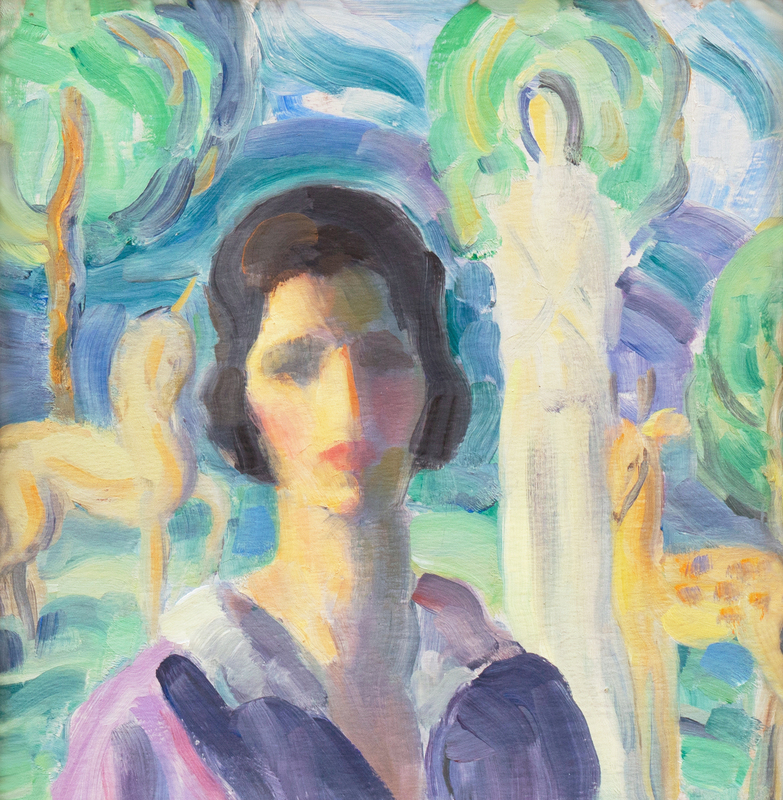 From 1918, she did a number of symbolic or dream-like paintings influenced by Will Levington Comfort, a Los Angeles philosopher who espoused meditation experiences. She also loved to do cheerful paintings that appealed to children, and the Samuel Goldwyn and Irving Berlin families commissioned her to do portraits and murals for their children. In 1931 in Los Angeles, she met Morgan Russell, co-founder of the Synchromy art movement. A student of both Matisse and Cezanne, he became Mabel's teacher for the remaining 20 years of his life, and his joyous sense of color and rhythmic form and structure fit beautifully with her natural tendencies. After her father's death in 1937, she returned to Hawaii for a year and painted portraits, figure studies, and still lifes. A trip to the Caribbean islands in the 1950s led to brightening of her palette and using many oranges, reds, and bright pinks in tropical genre scenes. Later travels to Mexico reinforced these tendencies. As she got older, she turned more and more to religious and symbolic subjects. She spent the last several years of her life in a Los Angeles nursing home and died at age 94 on March 13, 1985. She exhibited nationwide including at the Art Institute of Chicago and the Los Angeles County Museum and, in 1999, became one of a group of important American artists showcased in Paris by the U.S. State Department. In August 1999, a special exhibition of her work, titled "A Radiant Thread," was held at the Adamson-Duvannes Galleries in Los Angeles. "American Art Review", David Forbes, Encounters With Paradise; et al.